MotorSports Racing style, non-retainable studs can be completely removed from the panel when unlocked, which can be advantageous with sliding or curved panels. These do not have a groove under the head for a retainer so, grommets are not necessary for installation. 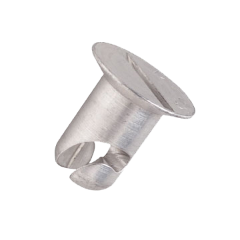 Aluminum studs have a bright, bare finish and can be anodized to prevent corrosion. They are silver-white in color and RoHS compliant. Additional sizes, materials and finishes are available upon request (minimums may apply).